Nature: Perrinois appears to be a realm similar to a swords and sorcery era Earth, complete with castles, dragons, and a few wizards/sorcerers. History: The wizard brothers Rasheed and Shiwa ven Garmchee have some rivalry, and they apparently rule Perrinois. (Spider-Man Team-Up#3 (fb)) - Staring into his mystic Pool of Diamonno, Shiwa was witness to countless flying vessels, flying amongst the stars, shooting beams of concentrated light at each other. He cast a spell to open a portal to that realm. Around the same relative time, Spider-Man (the Ben Reilly/clone version) deactivated the security at Four Freedoms Plaza so that he could sneak in and play a birthday prank on Johnny Storm, the Human Torch. The deactivation of said security allowed Shiwa's portal to access the interior of the building, drawing the attention of Spidey and all four original members of the Fantastic Four. When he got too close to the portal, the Thing was pulled into Perrinois by a giant tentacle. Reed stretched his arms in to retrieve him, but instead pulled Shiwa into the Earthly plane. Shiwa was instantly smitten with the site he had originally seen, which was actually a video game in Johnny's room. Spidey, Reed, and Sue passed through the portal to rescue Ben (maintaining a stretched arm and a web line as a tether back to Earth), leaving Johnny behind to guard Shiwa. Ben, meanwhile, plopped right into the middle of a castle into a chamber of fair maidens. He was believed to be a demon and attacked, and though the guards' swords could do no harm against him hide, he chose to flee the castle anyway, to gain some time to figure out how to get back to Earth. Taking a dose of cosmic rays from a portable gizmo given to him by Reed, he returned to the form of Ben Grimm. Figuring that his allies would fall out of the sky like he did if they came after him, he headed back into the castle, the tower of which was the highest point around. 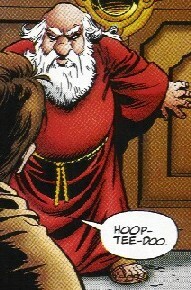 At the top of the tower, Ben encountered Rasheed ven Garmchee, who transformed into a Bordok to stop him. 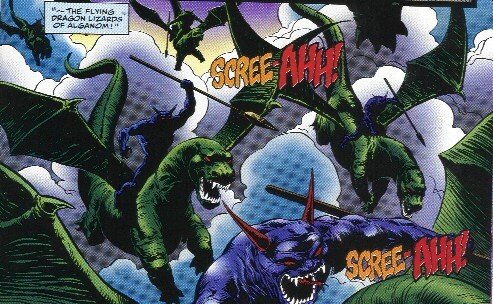 Ben turned back into the Thing, and when he proved powerful enough to fight off a Bordok, Rasheed then summoned the Flying Dragon Lizards of Alganom. Spidey, Reed, and Sue arrived at that point, right in the middle of the Dragon assault. Realizing that Shiwa had pierced the barrier to another world, Rasheed decided to open the portal wider and claim that world for his own. However, Sue--invisible--sneaked up behind Rasheed and clocked him across the back of the head, knocking him out. As Reed, Sue, and Spidey returned through the portal, Spidey threatened to destroy the video game (which Shiwa was still entranced by) if he did not close the portal to Perrinois. He then tossed the game through the portal, and Shiwa followed it, closing the portal behind him. Shiwa was less than happy to learn that since there was no electricity on Perrinois, the video game would be completely useless. Comments: Created by Dan Jurgens and Bob McLeod. One of the people of Perrinois references Crom (or, more specifically, Crom's beard), who was a god of the Hyborian era on Earth. No further information is given. There's no reason that Perrinois could not simply be a city or village in one of the many other realms of swords and sorcery we have been privy to. The brother of Shiwa, he was more prone to violence and sought to conquer other realms and rule all. His plot to take over Earth ended when Sue punched him in the back of the head and knocked him out. 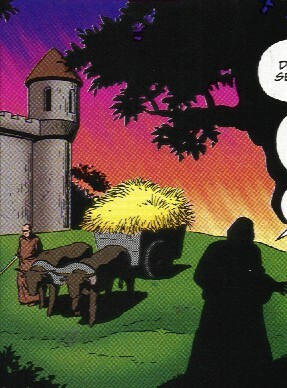 He could effect bodily transformations into powerful creatures, such as the Bordok seen to the right. Bordok's are very strong (Class 25-50?) and durable, and can breathe fire. 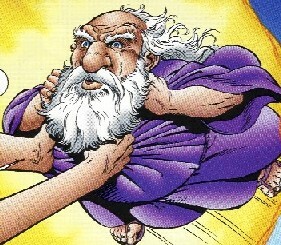 Rasheed can also project magical bolts of energy, as well as summon the Dragon Lizards of Alganom, which were ridden by demonic creatures, all under his control. A wizard of some power, he was the brother of Rasheed. Though there was some rivalry between the two brothers, Shiwa's greatest interest was in exploration and discovery. 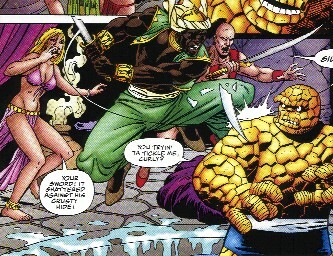 During the entire adventure with the Fantastic Four, he stood in front of a television set, mesmerized by the space war video game presented there. His only powers demonstrated were the opening of inter-dimensional portals, and sending tentacles through said portals. He utilized the Pool of Diamonno to observe other realms.